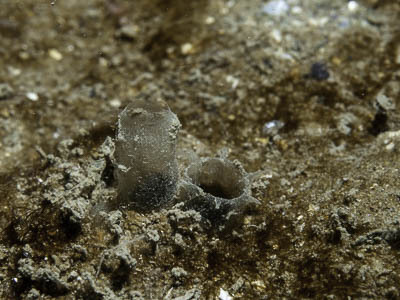 Description: This solitary ascidian lives buried in clean sandy sediment with only the siphons showing. It is spherical in shape and its test is covered with fine sand. Habitat: Open coast sites with clean sand sediments. Distribution: Found all round the British Isles. Similar Species: Compare with Molgula occulta which is similar but lives in muddier sediments. Picton, B.E. & Morrow, C.C. (2016). Eugyra arenosa (Alder & Hancock, 1848). [In] Encyclopedia of Marine Life of Britain and Ireland.